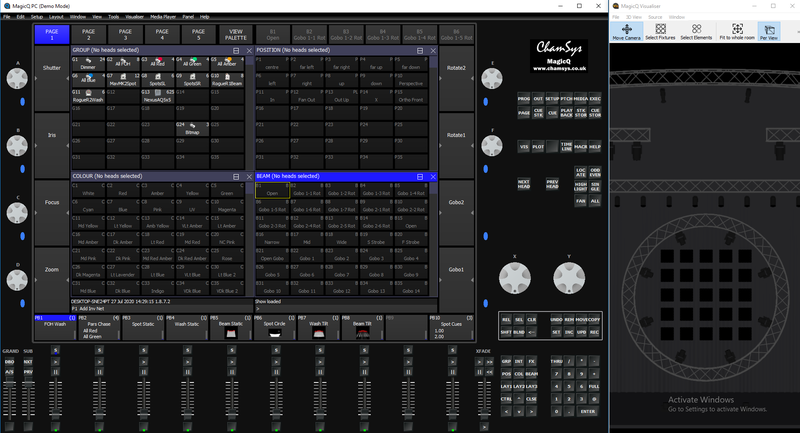 The features and functions of the MagicQ software and consoles and the ideas contained therein are the property of ChamSys Ltd. The console is intended for the control of lighting systems. No warranties are expressed or implied regarding the use of the MagicQ software of lighting consoles. No liabilities are accepted for the accuracy of the information contained within this manual. Copyright 2014 by ChamSys Ltd. All rights reserved. MagicQ includes a visualiser called MagicVis available for Windows, Mac and Linux. A standalone application called MagicVis that can connect to a MagicQ console or receive ArtNet or ACN data from other brands of console over a network. Part of the MagicQ PC application. This allows the editing and visualisation of a show on one PC. 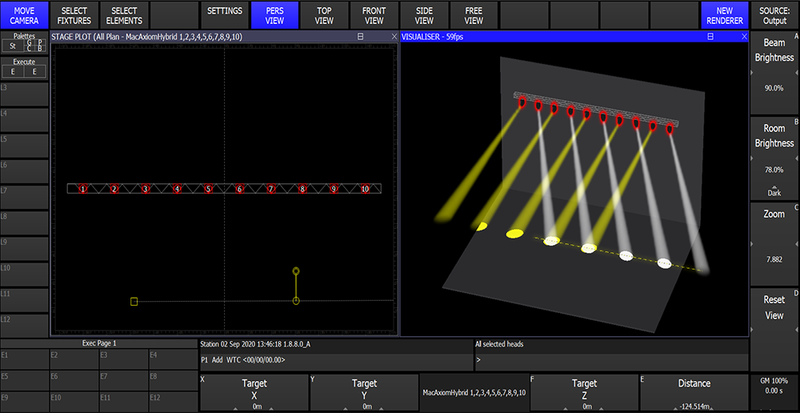 The MagicVis application enables Lighting Designers to add visualisation to their MagicQ console simply by connecting a network cable and starting the MagicVis application. The graphics and processor intensive visualisation is performed on the attached computer, thus ensuring that the MagicQ console continues to run at full performance. 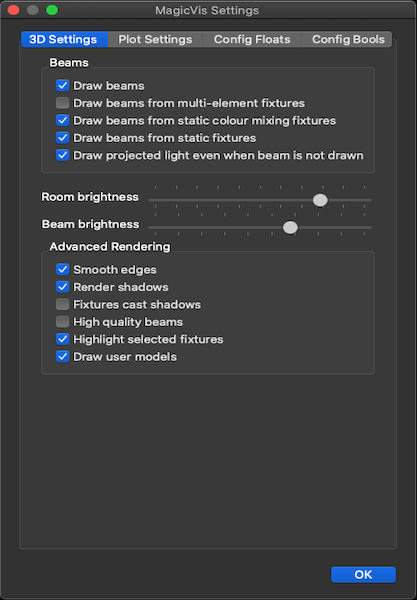 In order to render the beams MagicVis uses the graphics card in your PC / Mac - the better the performance of your graphics card then the better performance of the visualiser. PCs and Macs with shared graphics memory will perform slowly and will only be able to render small lighting rigs. A Nvidia or ATI/Radeon graphics card costing £100/£120€/160$ will make all the difference to your system. The separate MagicVis application can connect to a console or a separate PC running MagicQ software. The show will be automatically loaded from the console over the network. and ensure that Enable Remote Control and Enable Remote Access are set to yes. Connect the console and the PC/Mac with an inverted network cable, then start MagicVis. It should find the console automatically and connect. If the name of the console appears in red then make sure that Enable Remote Control and Enable Remote Access are set to yes on the console. If the IP address is red then it is on the wrong subnet. If MagicVis fails to connect to the console click on File → Settings… to bring up the Settings dialog. Click on the Network tab then choose the network adaptor/IP address of the network port that connects to the MagicQ console. Then select the console from the list. If the console does not appear on the list then check the connecting cable. Initially the title bar in MagicVis will show searching for consoles, then trying to connect once it has found a console. Once a connection has been made with the console then it will change to say waiting sync. Once the show data has been transferred over the connection from the console to the MagicQ vis application then it will change to say synced. If the system continues to say trying to connect then check firewalls are disabled. In some systems you may need to disable other network adaptors such as the wireless adaptor. Windows often classifies lighting networks as public networks and applies different firewall rules. Once MagicVis is synced then whenever you load a new show on the console or change the visualiser patch then the changes will automatically appear in the visualiser. When MagicVis starts it assumes that it will receive DMX data on ArtNet starting from ArtNet Universe 0-0. As soon as MagicVis has a connection with a console it then starts using the DMX protocols and universes in use on that console for each of the patched universes. If the universes are not enabled on the console then the console will send the DMX data directly to the MagicVis using its own MagicVis protocol. This enables MagicVis to be used on a system where the outputs are not enabled. Note that even when MagicVis is not synced it will visualise according to received ArtNet. ArtNet is sent separately to the connection for show data transfer. MagicVis can be used with third-party consoles other than MagicQ. The visualisation show must first be created in MagicQ and then loaded into MagicVis for use with the other console. Load a MagicQ show file directly into MagicVis by clicking on File → Load Show. In this mode there is no sync, MagicVis just looks at the incoming ArtNet data for rendering the beams but does not sync the patch. Once a show has been loaded using Load Show MagicVis will not try to sync with a console. Run the MagicQ software then go to the Visualiser menu in the menu bar and click on Show Visualiser. The window can be sized and moved to the required position. As the Visualiser is integrated with the MagicQ app it is not necessary to set up IP addresses or enable/configure universes. MagicVis provides five views – Perspective, Top, Side, Front, and Free. The view can be changed either from the View menu in the MagicVis window or in MagicQ in the Patch window, using Soft Button E. The Top, Side, Front and Free views are orthographic projections. If the camera is moved while in an orthographic view then the view automatically becomes Free. You can rotate the camera around by pointing the mouse at the visualiser window, clicking and holding then moving the mouse around. Move the camera back and forth with the scroll wheel, or by pressing CTRL and right-clicking. Hold down SHIFT, click and move the mouse to translate the camera and hold SHIFT and move the scroll wheel to zoom in and out. The lighting level of the room can be changed by clicking on View → Dark. The demo show files have visualiser rooms set up. The ExhibitionDemo file uses MagicVis extensively and includes MagicHD integration. Use these to see examples of how to create your own MagicVis visualisations. When you patch the first head in your show, MagicQ will prompt you whether you wish to auto insert heads into the visualiser. setup → VIEW SETTINGS → Mode → Visualiser. When you patch heads in VIEW HEADS, MagicQ patches the head in the VIEW HEADS view but also generates a visualiser object in VIEW VIS. Visualiser heads are separate from MagicQ heads – for instance you can have multiple visualiser heads associated with one patched head. You might want to do this if you had two par cans on a single dimmer channel – you would have one Generic Dimmer patched in MagicQ and two visualiser heads. By default when you patch heads MagicQ creates one visualiser head per MagicQ head. You can add extra visualiser objects for a head using INSERT. The VIEW VIS view manages the data for the visualiser. There are several different tabs including Selected Heads, Vis Heads, and Attach Objects. In Selected Heads, all the visualiser heads for the currently selected heads will be shown in the list. Heads are selected as usual using groups or direct from the keypad. In this view the encoders and soft buttons will apply changes to all the visualiser heads for the selected heads. In Vis Heads, all the visualiser heads are shown. In this view the encoders and soft buttons will apply changes to the visualiser head under the cursor. Use SHIFT/CTRL and the cursor keys to apply changes to multiple heads. In Attach Objects, all the other (non fixture) objects are shown in a list. In this view the encoders and soft buttons will apply changes to the object under the cursor. Use SHIFT/CTRL and the cursor keys to apply changes to multiple objects. you will have direct control of the positioning and orientation of the head using the encoder wheels and soft buttons. Encoders X, Y and F are used for X,Y and Z positioning. Pressing the soft buttons X, Y and F increases the position by 1 metre on that axis. Pressing SHIFT + the soft button decreases the position by 1 metre on that axis. Use fan to spread the position apart on the X,Y, or Z position wheels. Encoders B, C and D are used for rotation around the X, Y and Z axis. Pressing the soft buttons B, C and D rotates the heads by 90 degrees around that axis. Pressing SHIFT + the soft button rotates the heads by – 90 degrees around that axis. You can also enter values directly into the spreadsheet view of the VIEW VIS window. You can change multiple values at a time by using SHIFT/CTRL and the cursor keys. Use THRU to enter a spread of values e.g. -5 THRU 5 to spread the X position between -5 and 5 metres. In View Attach you can insert many different types of object, including trusses, pipes, people, simple shapes and commonly found furniture. To create an Object press the INSERT soft button, then select what kind of object is to be created. The object is then created and added to the list. To add a sphere or a cylinder create a Form object then go to the model column, press Set and select the desired shape. Enter values in the window for length, width and height. Adding a ' after the number enters the dimension in feet rather than metres – so for 10 feet enter 10'. Position the truss or pipe as required. Enter a name in the window for the truss or pipe. After you insert a truss or pipe, then subsequent heads that are patched will be attached to that truss or pipe object. If for example you patch 6 spots after inserting a truss object, then they will be spread out along the length of the truss. When you create reports, then as well as overall plots, a plot is created for each attach object – enabling the lighting rig to be broken down into separate pipes and trusses. A texture can be applied to a Form object by entering the name of the texture in the Texture field. The texture should be stored in the bitmaps folder, for example ChamSys.png. 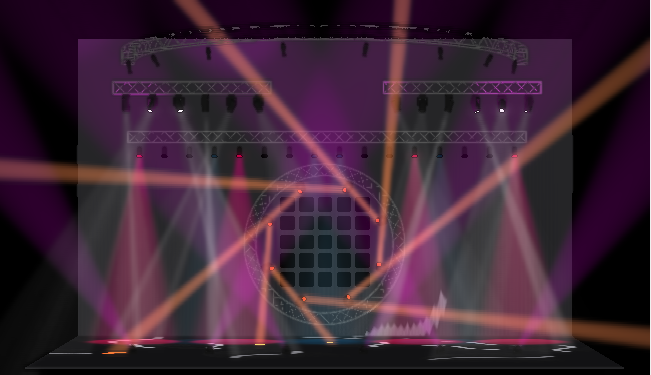 Create a truss and set the model to Invisible to group lights together and create useful plots for them. For example in the ExhibitionDemo show the PixelLine fixtures may be rigged on individual vertical pipes but in MagicVis they are all rigged on one invisible truss which is rotated so that when the paperwork is created there is a plot with all the PixelLines on it rotated so that it is obvious how they are laid out. To add a drape to the scene press the INSERT soft button, then select Drape. The drape will then be added to the scene. The width, height and depth of the folds can be adjusted as usual, as can the position and rotation. The extra params columns at the end of the table allow fine control over how the drape is rendered. Param 1 controls the size of the wave. This defaults to 0.3m. Param 2 controls how flat the folds are at the top of the drape. A value of 0 will show them entirely flat at the top, while a value of 1.0 will show the folds at the same depth as they are at the bottom, as though the drape were hung from a track system. Param 3 sets the randomness of the folds. Real drapes do not hang evenly so the folds are often different sizes. Setting the Param to 0 will make all the folds the same, increasing it will make them vary. The default value is 0.4. Heads can be attached to trusses or pipes at any time. Select the fixtures you wish to attach using groups or the keypad. Change to VIEW VIS → Selected Heads tab and press the FIT TO OBJECT soft button. Alternatively in the Vis Heads tab, double click on the Attach field. MagicQ will prompt you with a list of all the attach objects to choose from. Heads that are attached to an object move with that object – so repositioning that object in the Attach Objects tab will move the object and all the attached heads. MagicVis supports Hang Types so that Heads can be fitted to Attach Objects in specific orientations. This information is also available in the MagicVis reports. Hang type options are Normal, Bottom rear, Bottom front, Top rear, Top front face up, Top front face forwards, Top boom, and Bottom Boom. In Patch, View Heads it is possible to set specific shapes and beam angles for generic heads. When set these fields override the defaults from the chosen personality. The shape is also shown in the Fixture Patch report. If you wish to change the beam angle for fixtures other than generic heads then you must change the Zoom Narrow and Wide in the Params tab of the Head Editor for the chosen personality. MagicVis can preview the output from media servers, including MagicHD. First of all make sure that the Media window on the console is displaying a live preview of the media server output. Then, in the Attach Objects window add a Form. Set the Model to Sheet and set the Texture to mp and the number of the media server. The Media Server number can be found in the Setup, View System, View Media window. For example if the media server was the first in the View Media window then the Texture would be mp1. If MagicVis is unable to connect to the media server then the sheet will display “Media Server 1”. If there is still no connection after 1 minute then the text will disappear. The preview is done via CITP so is quite low resolution. To make an attach object movable via DMX patch a Generic Movement head into MagicQ. Then in Patch, View Vis set the attach object for the Generic Movement to be the Attach object to move. Any fixtures hung from the truss will move along with the truss. The Generic Movement head has X, Y, Z position and X, Y, Z rotation attributes enabling complete control of the object from within MagicQ. The Generic movement head is a virtual head so it can be unpatched in the MagicQ Patch. In the ExhibitionDemo showfile there are 2 moving pipes. Each pipe has a form attached to it on which the MagicHD image is rendered. This provides a nice simulation of moving LED walls. In MagicVis it is possible to set a Head item to colour an attach object, for truss warmers or for coloured scenic pieces. In Patch, View Vis on the Selected Heads or Vis Heads tab page right to get to the Col Apply column and set it to Yes. If there are more than one heads attached to an object with the Col Apply set then it will use the last one in the list. The Generic Camera head enables the Visualiser view to be modified from within MagicQ programming. When a Generic Camera is patched in MagicQ and the Mode Attribute is non zero then the Visualiser view comes under the control of the Camera. The Generic Camera head is a virtual head so it can be unpatched in the MagicQ Patch. To use the Generic Camera select it then press Locate. This will put the camera into perspective mode and place it in the default position. Select the Position window then use the encoders to move it around and rotate the view. To return control to the Visualiser window use Encoder Wheel A to set the mode to Disabled. The Generic Camera also controls the brightness of the room and of the beams. These attributes can be found in the Beam window. FX can be applied to the position and rotation attributes to make the Camera fly around the visualiser and give a dynamic view of your design. To remove a visualiser head go to VIEW VIS → Vis Heads and put the cursor on the item. Press REMOVE. Use SHIFT/CTRL and the cursor keys to cursor select multiple visualiser heads for removal. To remove an attach object go to VIEW VIS → Attach Objects and follow the same procedure. When heads are removed from the visualiser they are not removed from MagicQ patch. Removing heads from the MagicQ patch will remove any associated visualiser heads. It is possible to change the size of the room by adding a Room Object. By default MagicQ uses a room 20 x 20 x 20 metres. If you add a room object then MagicVis will use the dimensions of the room object instead. The datum is always on the floor in the centre of the room. In View Attach, press INSERT. Select the object type Room and enter the length, width, and height. You can use MagicVis to create plots and patch sheets. In the MagicVis window click on File → Paperwork. This will bring up the Reports window. You can select what you would like to include and either print it out or create a PDF document. You can also export patch lists into a spreadsheet such as Numbers, LibreOffice Calc or Excel. 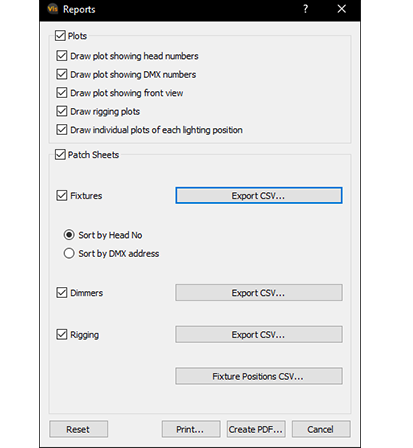 To do this click on one of the Export CSV… buttons, then load the csv file into a spreadsheet. You can then add extra columns or lay out the tables however you like. The Patch Sheets contain all the heads in the patch, whether or not they are in the Visualiser. Therefore you can create a patch sheet without having to load fixtures into Visualiser. The Positions table is a list of all the trusses and pipes with trim heights, DMX universes and approximate weights. The given weight is the total weight of the fixtures and does not include the weight of the cabling, truss or rigging. It is intended to be a tool for estimating total weights and should not be used for rigging calculations. Old MagicQ show files can be loaded into MagicQ, but they will not have any visualiser heads defined. It is easy to take heads from an existing show file and create a visualisation. and press the INSERT SELECTED soft button. This creates a visualiser head for each of the selected heads. If you wish, you can attach the heads to an object using the FIT TO OBJECT soft button. and press the INSERT PATCHED soft. This creates a visualiser head for each head in the patch. The heads will be positioned in a grid format. It is possible to convert a grid from the MagicQ Plan View into a visualisation. In the Output Window, View Plan press SHIFT + ARRANGE VIS. MagicQ will prompt you for the positioning within the visualisation. For each of the heads in the grid a visualiser head will be will be inserted into the visualiser. The positioning will be set according to the position in the grid. For example if you select Top, then MagicQ will treat the grid as if it is a top view and all the visualiser heads will be positioned at the top of the room at the same height. MagicVis includes settings for how the visualisation looks. On systems with lower power graphics cards which are using a lot of LED fixtures we recommend to turn off drawing of LED Beams. MagicVis incorporates a new higher quality renderer with improved beams and shadows. To enable the higher quality renderer open MagicVis and go to File, Settings and select "New renderer" from the OpenGL options. If for any reason the new renderer does not work, then you can revert to the old renderer by opening MagicQ and from the toolbar select Visualiser, Use old renderer. 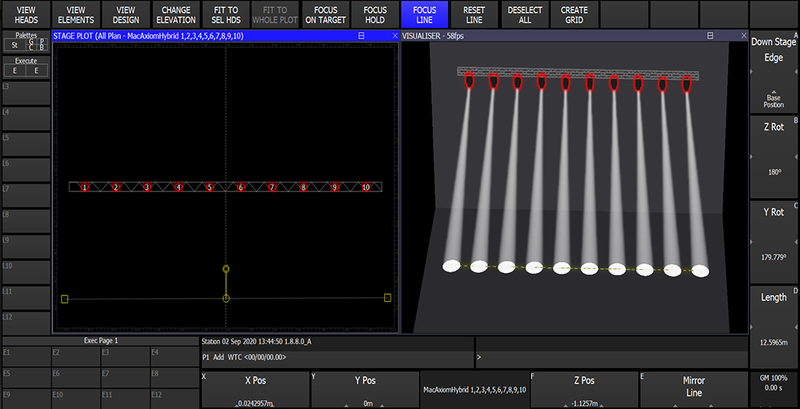 MagicQ now incorporates a Plot Window displaying the position and orientation of fixtures within the lighting rig. The Plot Window can show Front, Overhead and Side elevations, restricted to either Flown or Floor fixtures and the view can be moved and zoomed. The view can be restricted to only selected fixtures or to all fixtures. Fixtures can be selected from the plot window either by clicking (touching) individual items or by multi selecting multiple items. The positional information is taken from MagicVis and can be edited in the Patch Window. The Plot Window is available on MagicQ PC for Windows, Mac and Linux, and the MQ80, MQ500 and Pro2014 consoles. It is not available on Compact consoles. 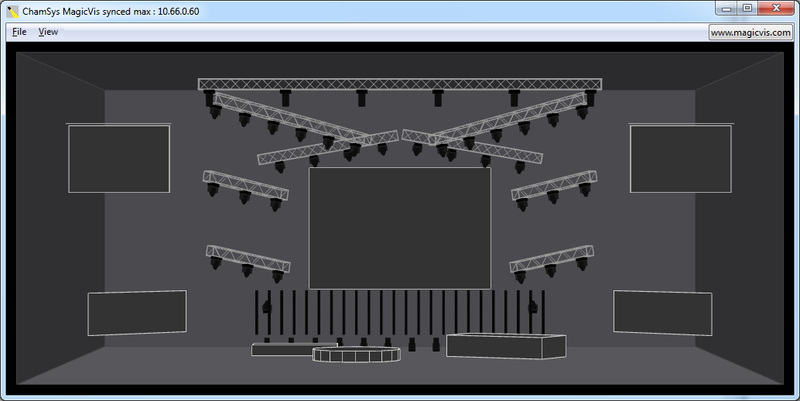 It is possible to set the pan and tilt of selected fixtures from the Plot window so that the fixtures are focused on a point on the stage. To quickly focus the lights on a point press the FOCUS ON TARGET soft button then click on a point on the plot. The selected fixtures should all move around to focus on that point. Click on FOCUS HOLD if you want to move the point around after clicking. On a touch screen you can move your finger around the plot window and the fixtures should follow it. Click on FOCUS HOLD again to stop focusing. More complicated looks can be created with the FOCUS LINE feature. After selecting some fixtures and clicking on FOCUS LINE a yellow line will appear on the plot. The fixtures will be focused along the line. The line will also appear in the 3D visualiser. The line can be moved around either by clicking on the points on the plot window or by using the encoder wheels. The line is initially at stage level but can be raised up using the Y encoder. FOCUS LINE allows easy creation of even stage washes but it can also be used to create gobo washes on walls and scenery or ACL style beam focuses. Use the Fan menu to change how the beams are distributed along the line. To create a symmetrical ACL style look first focus one side of fixtures, then select the other side, select FOCUS LINE again and press Encoder E, Mirror Line. This will mirror the line over the centre line of the stage so the look is symmetrical. The Base Position is the starting position for the fixtures before they are panned around to focus on the point. If the fixture has to pan more than 90° from the base position then it will flip the head over. The default base position is directly downstage. If the lights flip while they are moving between positions then a different base position may be required. To change base positions record a palette with the desired base positions then press and hold encoder button A and select the palette. For example if you have two trusses either side of a catwalk you may want a base position where everything is focused directly onto the catwalk. Another Base Position option is Current Position. This option will allow the fixtures to spin right round and only flip when they reach the end of their pan. This could be useful for creating specific movements between positions. It is possible to convert a plot into a grid using the CREATE GRID soft button in the Plot Window. MagicQ takes the heads from the current view and current filter in the Plot View and creates a new Grid in the Output Window. MagicQ will only create a grid if it can fit all the heads shown in the current Plot View into a grid of maximum size 100x100. We recommend to filter using groups or selected heads to only include the required heads in the new Grid. If the Plot involves a large number of fixtures close to each other or overlaid over each other then the conversion will not work. MagicQ supports Blind Visualisation and Preview Visualisation when used together with MagicVis, Capture or WYSIWYG. This enables a Visualiser to show the contents of the Programmer during BLIND mode or to preview a Playback that is not active on the real outputs. In Patch, View Vis press the VIS SOURCE Soft button to choose between visualising the console Output, the BLIND programmer, the Programmer Only, the selected Playback, or the next step on the selected Playback. When set to “Blind Programmer” MagicQ will add the contents of the Programmer to the Output visualisation even when the programmer is in BLIND mode. When set to “Prog Only” MagicQ will show the contents of the programmer without the current playback state regardless of the Blind state. When set to “Playback” MagicQ will show in the visualiser the contents of the selected Playback as if the Playback fader was at 100%. Only data from the selected Playback is shown. When set to “Next GO” MagicQ will show in the visualiser the output of the console as it would appear if GO was pressed on the selected Playback. When the selected Playback has multiple steps then MagicQ always shows the next step in the Visualiser. If the selected Playback is not active then MagicQ will show what would occur if the Playback was activated. When set to "Output" MagicQ will the console live output. Blind Visualisation and Preview Visualisation do not affect the normal network outputs such as ArtNet, ACN, or Pathport. Only the DMX stream sent directly to the Visualiser is affected. When using Capture visualisation, Capture must be connected via CITP universes rather than ArtNet – otherwise Capture will just show the console output. MagicVis now supports split visualisation where it is possible to show simultaneously both the Live Output and the Blind Visualisation. In MagicVis select View, Split Screen. The upper window will always show the Live Output. The lower window will show the normal MagicQ visualisation - which will depend on the Vis Source option above. When set to "Output" it will show the same as the upper window. Note that when using stand alone MagicVis, for both the Output and the Blind Preview to work then the console Output must be set to output over the network using a network protocol such as ArtNet, ACN or Pathport - otherwise the Output will not be shown when Blind Preview is in operation. In Setup, View Settings, Mode set the Visualiser option to "Auto insert, auto Previs" for automatic pre visualisation. When MagicVis is running with the 3D view with Output as the source and BLIND is pressed on the console, then MagicVis automatically changes to split Output/Blind Preview mode so that both the output and Blind programmer can be monitored. When BLIND mode is exited then MagicVis returns to the single 3D view. When MagicVis is running with the 3D view with Output as the source, and a S button is held on the console then MagicVis will change temporarily to show the contents of the Playback rather than the Output. On releasing the S button MagicVis reverts to showing the Output. MagicQ consoles use the Debian and Ubuntu Operating Systems. Details and links to sources can be found at https://www.debian.org/ and https://www.ubuntu.com/. The following are distributed alongside the MagicQ application. Versions prior to v1.5.6.0 of MagicQ the software also used the MicroWindows library, details can be found at http://www.microwindows.org/. Art-Net™ Designed by and Copyright Artistic Licence Holdings Ltd". The Qt Toolkit is Copyright (C) 2016 The Qt Company Ltd.
by all standard GIF decoders. Copyright (C)<YEAR> <AUTHOR>. All Rights Reserved.